At the John Deere machinery plant in Mannheim, different tractor models are built at one assembly line. With coordinated logistic procedures, the assembly line is fed with the right amount of components at the right point of time for the right model. For the sequencing, 4 parts with different versions are kitted in one sequencing wagon. The confirmation of the sequencing steps takes place in two phases, combining common paper- and scan-based confirmation using handheld scanners. The demand for lean and efficient processes with high quality as well as high productivity levels asks for mistake proof operations to avoid problems at the assembly line. The speed and the error rate of the current picking process needed to be enhanced as well as the flexibility of workers. We chose Ubimax because of their high number of references. Ubimax could show us that their technology delivers a value in real-life production environments! Workers need both of their hands, in order to handle the often heavy vehicle components. An enhancement, therefore, should also consider the ergonomic factor, beside efficiency of the picking application. It took Ubimax only three months to develop and implement a solution based on the John Deere requirements. 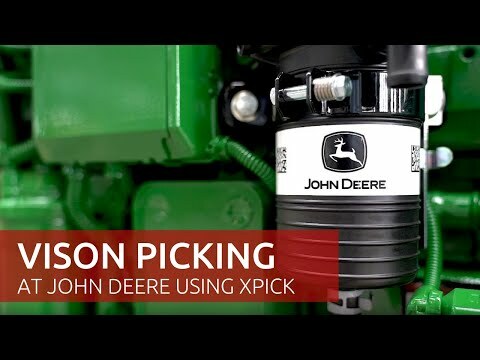 The Vision Picking Solution xPick was introduced, optimizing the sequencing process. After a short ramp up time, the full production targets were met with the Ubimax Solution. Vuzix M300 Smart Glasses (with intuitive graphical User Interface) are used, offering a highly adjustable smart glass for different preferred mounting options. Touch or voice control allows extremely easy operation. As a general principle, users have both their hands free while they are working. The camera in the glasses is also used as a barcode reader for the confirmation process. The benefits of the hands-free Vision Picking Solution were measurable after only two weeks in use, supporting the sequencing and increasing the process quality. Through the implementation of xPick, a reduction of the error rate down to zero was achieved and the intertwined operations were unraveled. Next to error rate improvement, the ergonomics were significantly enhanced by introducing hands-free working where it is really needed. The implementation of the Ubimax solution also favors a shorter training time for new employees as well as a more flexible employee deployment.